Leaving early from our amazing Air B&B to pick up our car from Sixt. On the road we found the app maps.me app very useful for navigating our way around downloading the areas needed for offline sat nav. Saving Money when hiring a car. Programming our destination mostar with a traveling tile of 1:40. 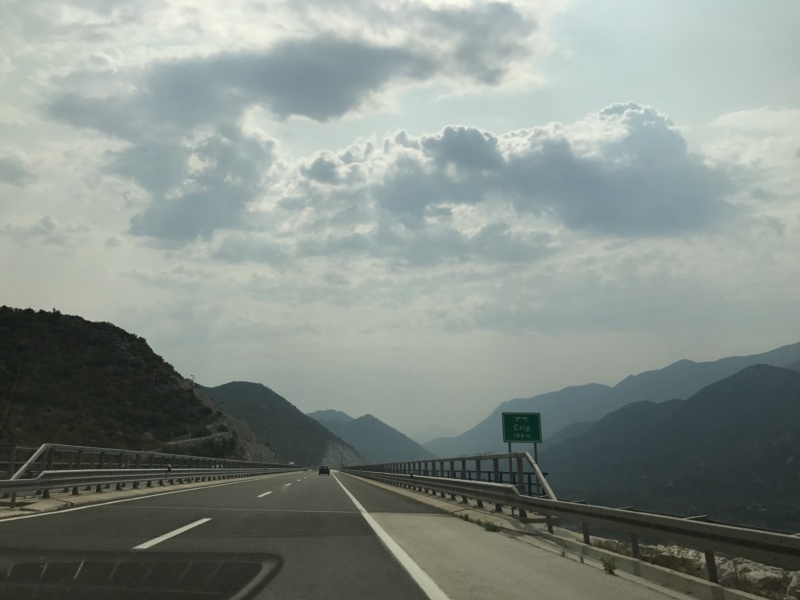 Along the road there are many tolls to pay the first cost us 57kuna before arriving into Bosnia. Arriving into mostar via car we could already see it was going to be beautiful, dropping the car in a car park for the day/night. 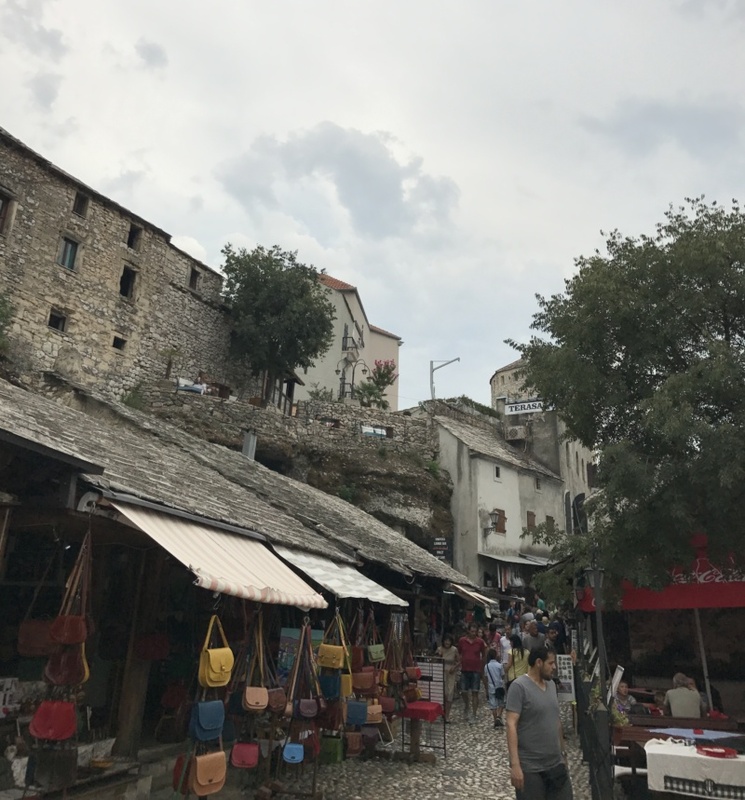 We wandered the old town of Mostar, it was very beautiful with cobbled streets, Street sellers and lots of little shops and bazaars. 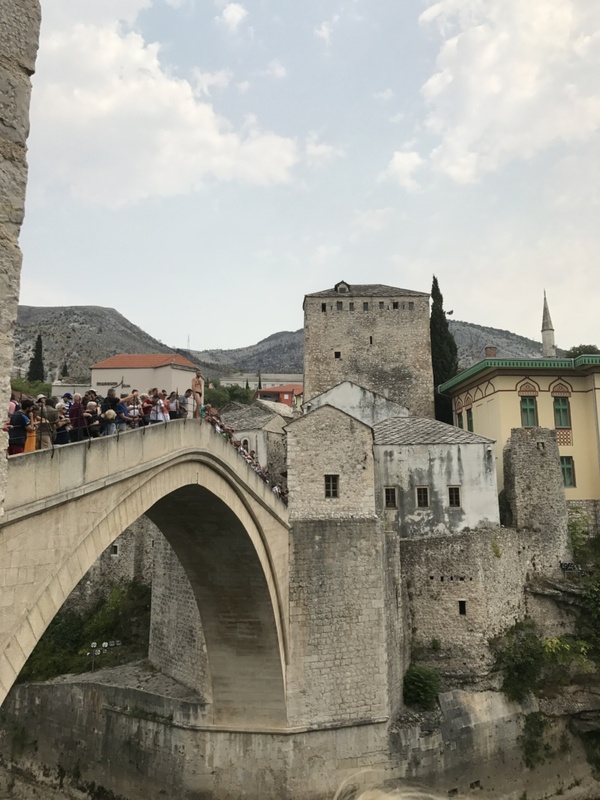 Until we got to Stari most the famous bridge of Mostar the bridge is very impressive, I had heard stories on articles before we arrived that boys coming of age jump off the bridge. 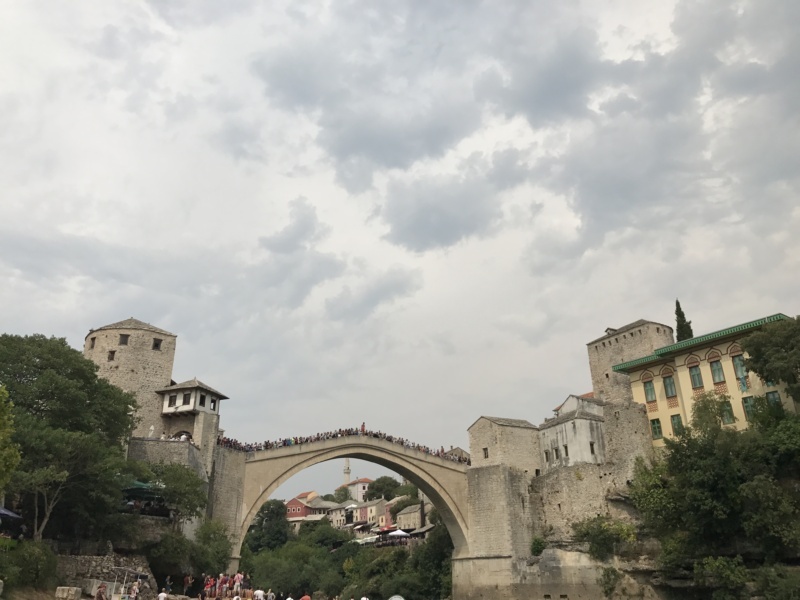 That wasn’t exactly how it seemed a few men in swimwear would parade up and down the bridge collecting money and when they had enough they would jump, this would go on until a huge crowd had gathered and then finally jump. Then whole process would start again all through the day. After a morning of exploring we stopped for lunch at a fast food cafe and had meat platter. It cost us a total of 12 Bosnian Marks for lunch a £5 bargain. 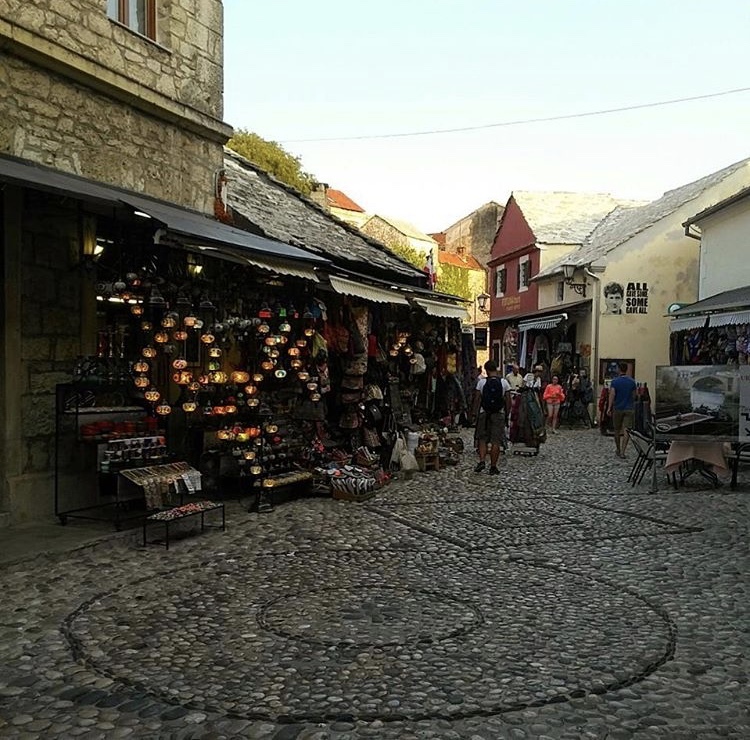 Mostar was very busy when we were there in August the city streets were jam packed with tourists and day trippers. After lunch we went to the mosque which can be seen up the river from Stari most. It has a very narrow spire which is climbable. 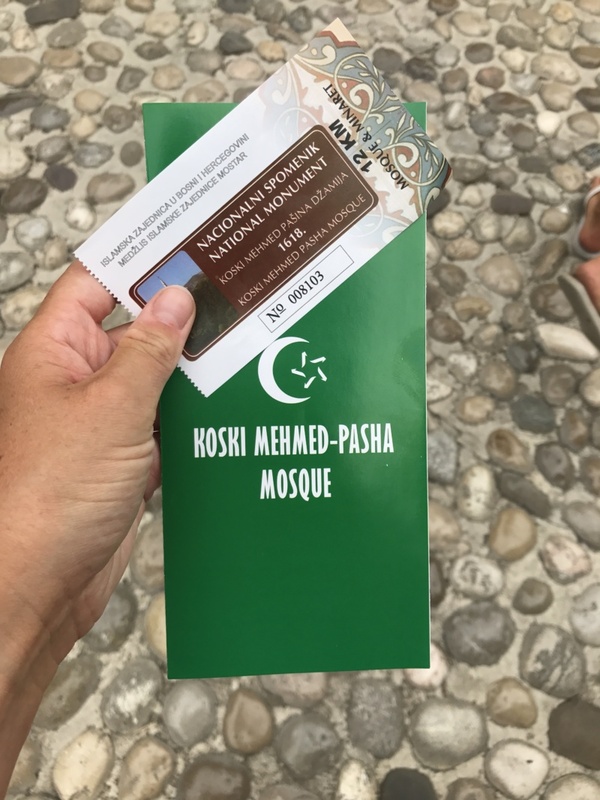 Koski Mehomed Pasha Mosque is 12 to go up to the top of the spire. If you are not dressed modestly to visit the mosque then here are scarves you are able to borrow. The passage to the top is very narrow, steep and very hot. Once at the top the views are incredible. I took hundreds of photos of the panoramic view. Kanaba milinica nevetva along the river we called into for a few drinks after a busy day and people watch on the bridge. Our Air B&B was late check in after 4 pm. The crooked house is one of the original homes on the famous street. The Crooked House/Kriva kuca centrally located and close to everything. 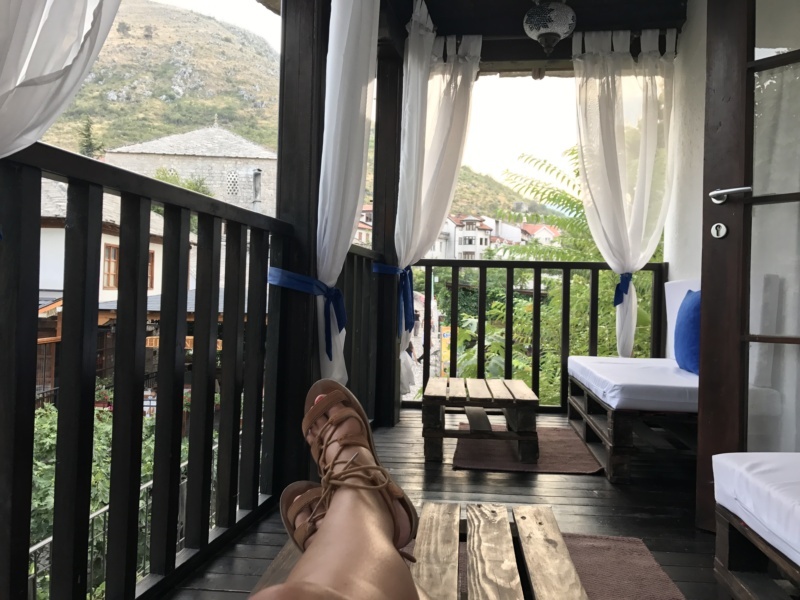 We had a relax on the balcony before getting ready and a couple of glasses of local wine. Before heading out for the night after an exhausting day exploring our latest stop on the road trip (See itinerary here). 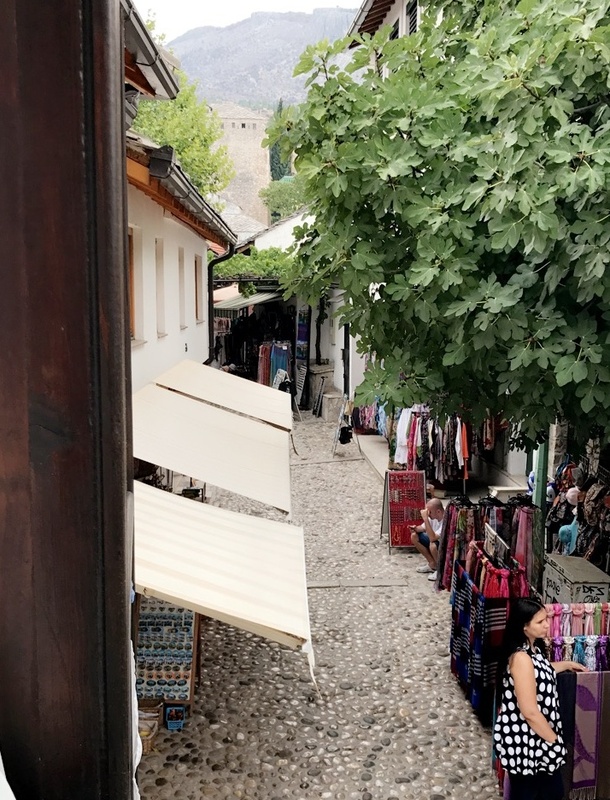 It was the perfect spot to relax and people watch and see what people were buying from local vendors in the street below. 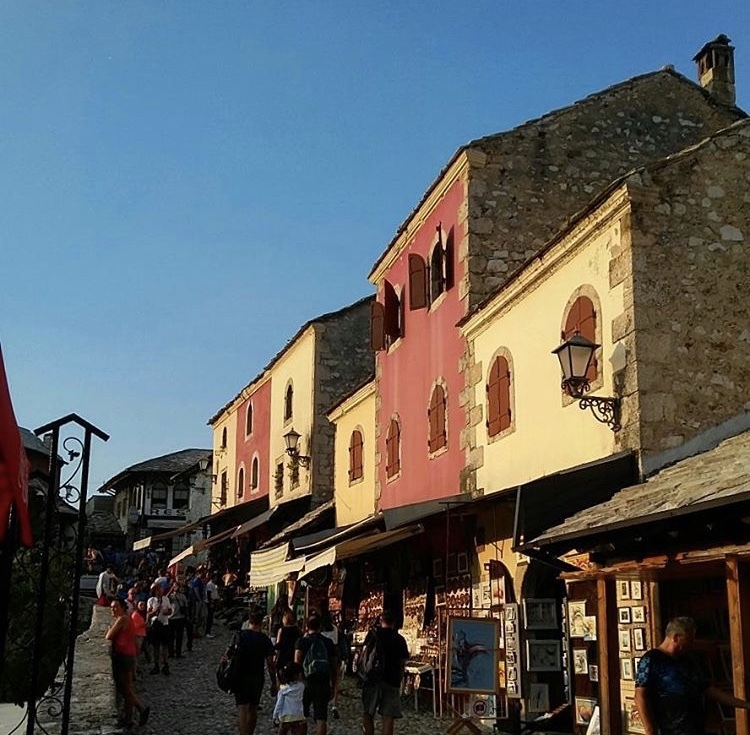 We had a quick wander around the quietening streets as day trippers begun to leave the city. 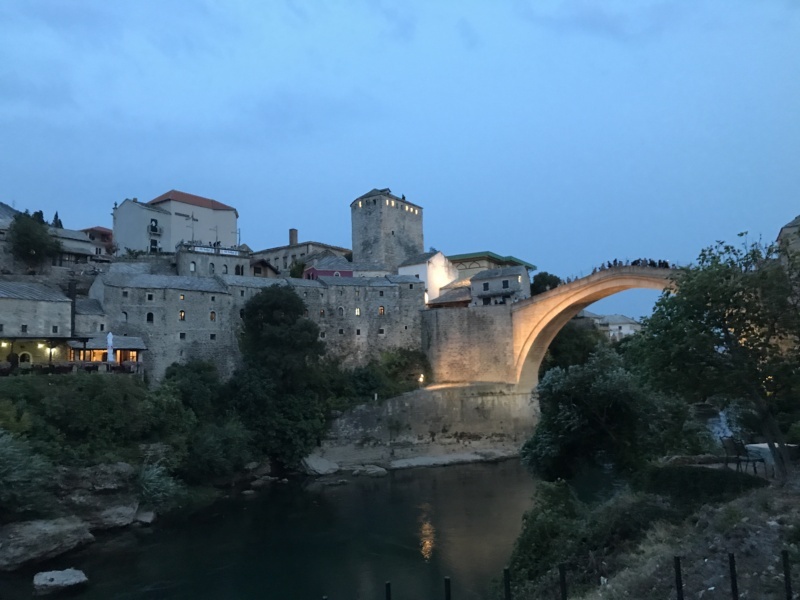 The photo below is taken from Stari Most down the river as the sun set. All the water front dining down the river gives you a great view of the bridge whilst you eat. 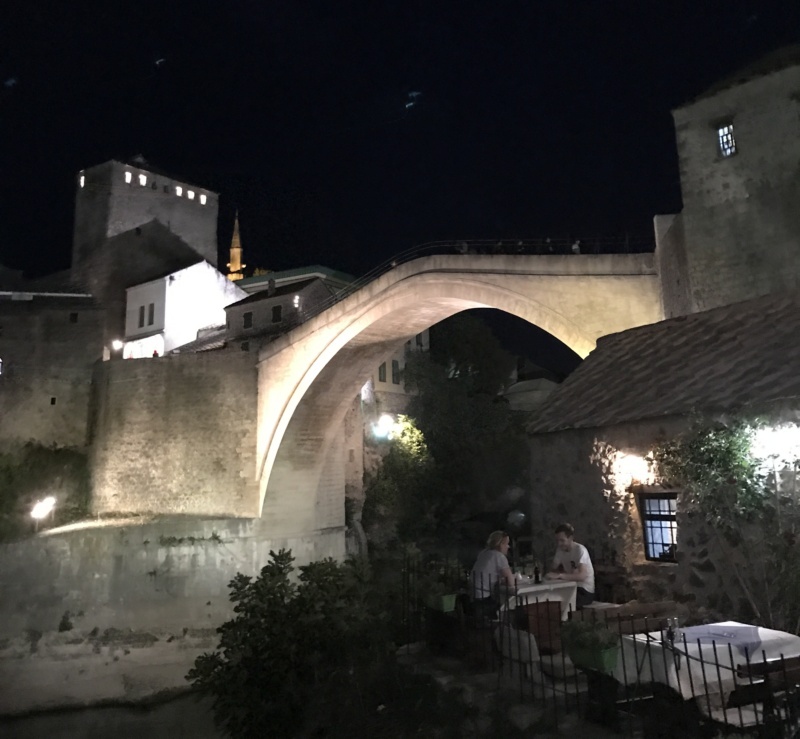 After a wander we returned to the bar we went to earlier having a few snacks and local wine and beer as we saw Stari most begin to light up as night set in to the city. The bridge steadily gets calmer at night.. finally. 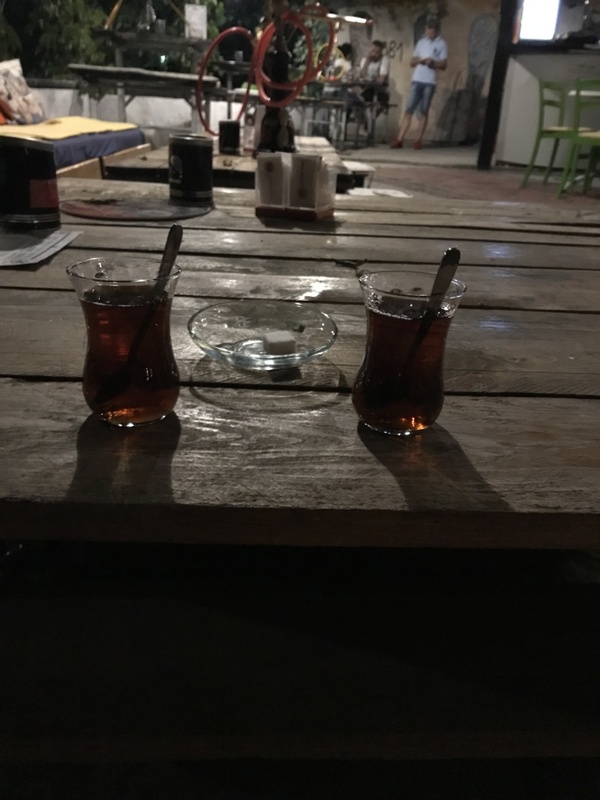 Just down the road there is a small bar hat offers Shisha very cheap 2 for Turkish tea and 5 for Shisha. 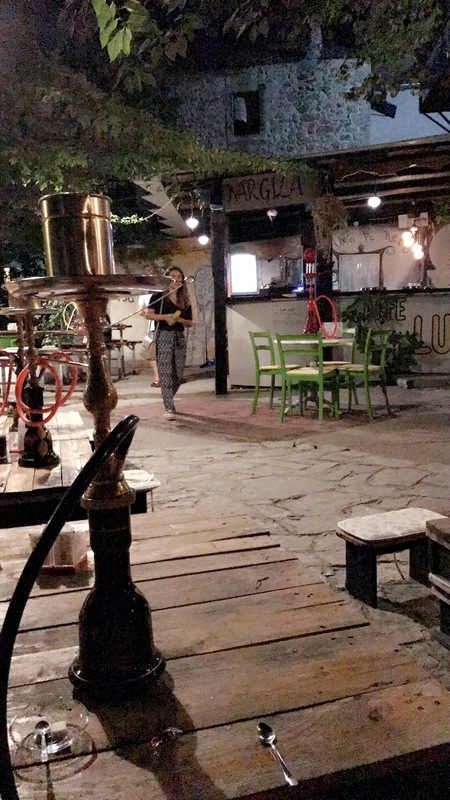 We had a brill night as the day trippers left after sunset Mostar becomes quiet, I would recommend staying the night to get the best of Mostar. 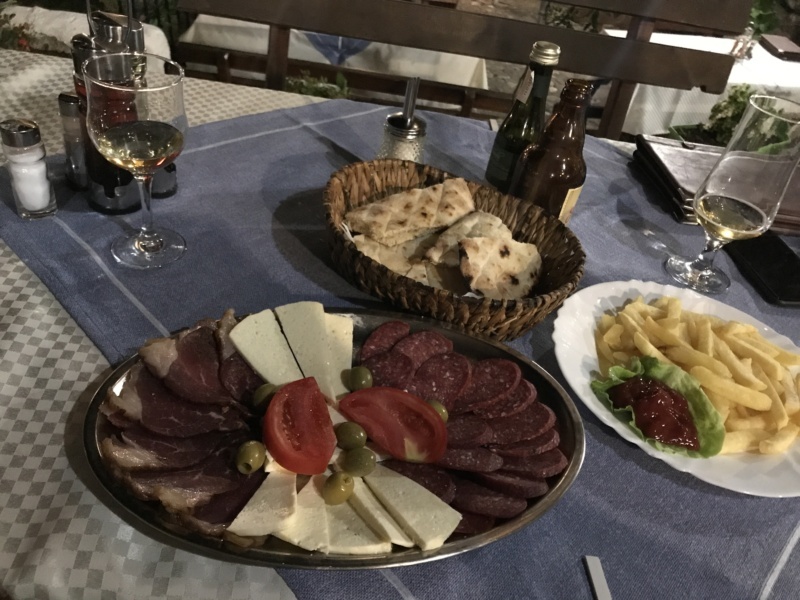 A quiet night was much needed after a hectic week of road tripping and trying to see all of the sights we could through Montenegro and Croatia. 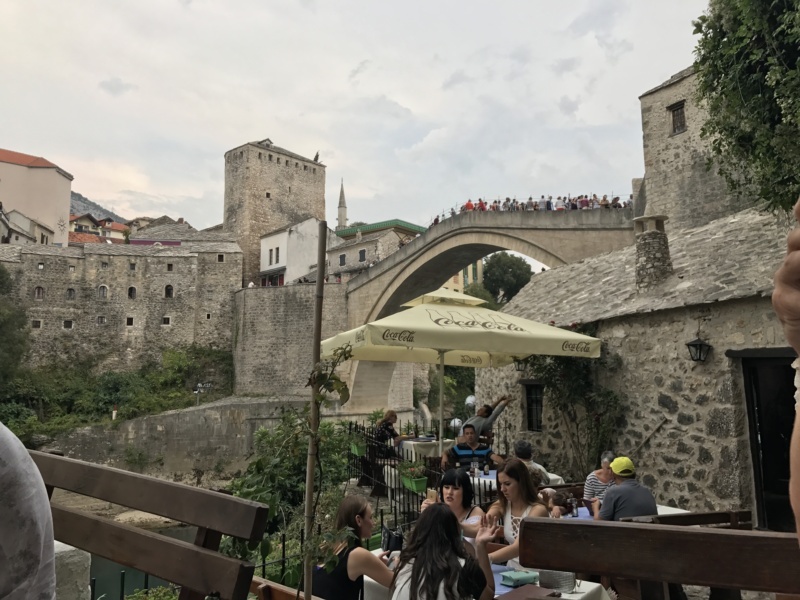 We were advised to go to places outside the old town into the new city but due to time constraints we decided to just relax on our evening in Mostar ahead of our early get up back to Croatia. 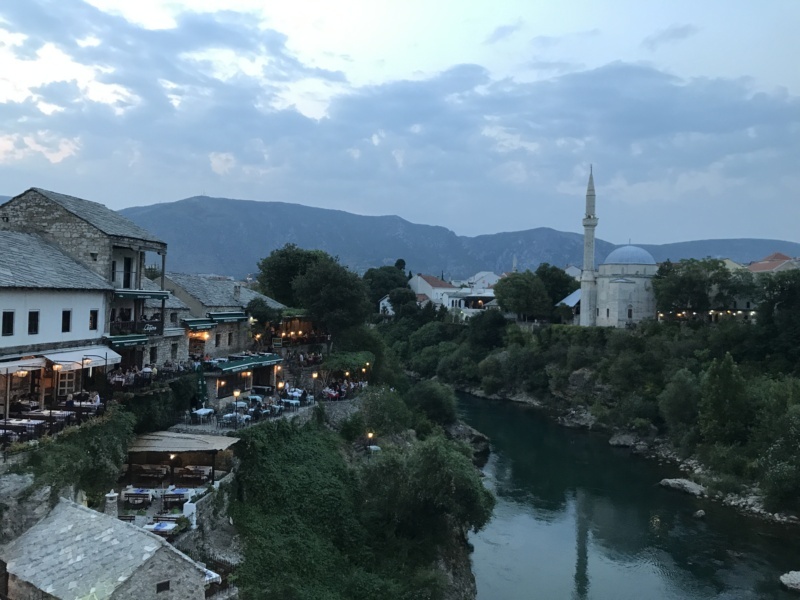 Mostar was a beautiful city and I was not too sure what we would find when we arrived. 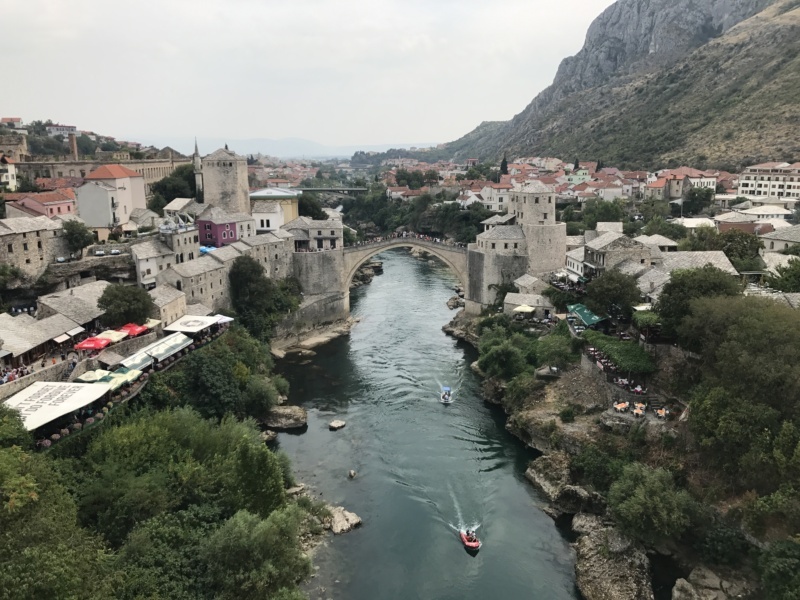 we had a lovely relaxing time there and I still could not below how beautiful Stari Most was in person. There was so much more we could have seen and crammed so much more in but after a week in a relax was needed to recharge. 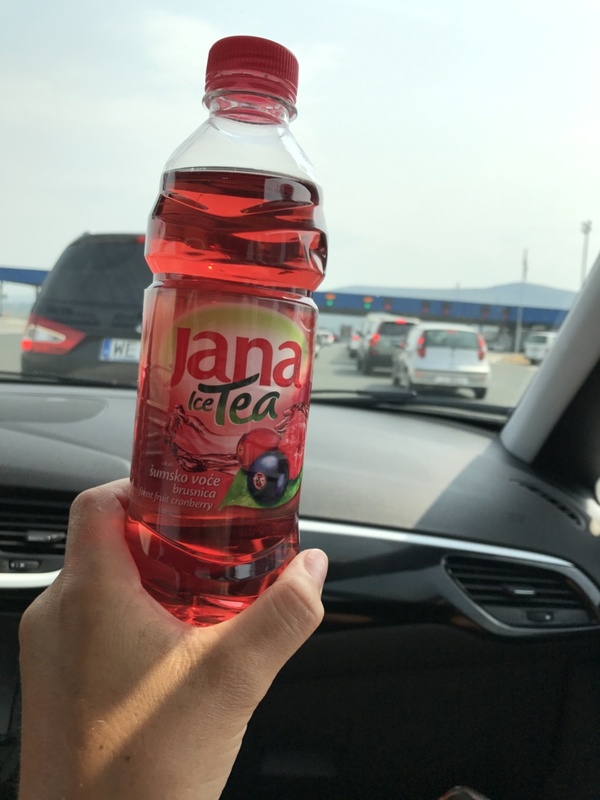 Keep your eyes peeled for the next post of the series – Krka Lakes, Croatia for discovering one of Croatia’s national parks en route to Zadar.